As New Englanders, we are privy to know something that many in the world cannot experience: winter. This year has been harsh but we all KNOW that beneath the surface of our snowy yards lie pansies, tulips, lilacs and all the magic of spring! As icky as we know it can get, we also KNOW that there is so much potential lurking right below the surface just waiting for the right circumstances to burst forward and bloom. We see the same with our people in our office. Often times, when they first come to see us, they feel as if they are in the “winter” of their health, and like this winter, it often seems like it’s never going to end. But with the proper nurturing care, over time they begin to experience the body’s great resilience and potential for healing, and they begin to “come alive” again. “How would you do that?” I asked. “What does it need?” I pressed. When we look at a plant, we know that it can come back to life through natural laws – simple sunlight, water, and food. So, why is it, that when our culture looks at healing the body, our first course of action is to consider unnatural, chemically-based pharmaceuticals and possibly unnecessary, invasive surgeries? We have forgotten that our bodies, like all living things, are made to obey the natural laws of health. When we do that, our bodies’ intelligence begins to work toward healing. What if there were a few simple, natural, nurturing ways to restore health? Would you try them first? 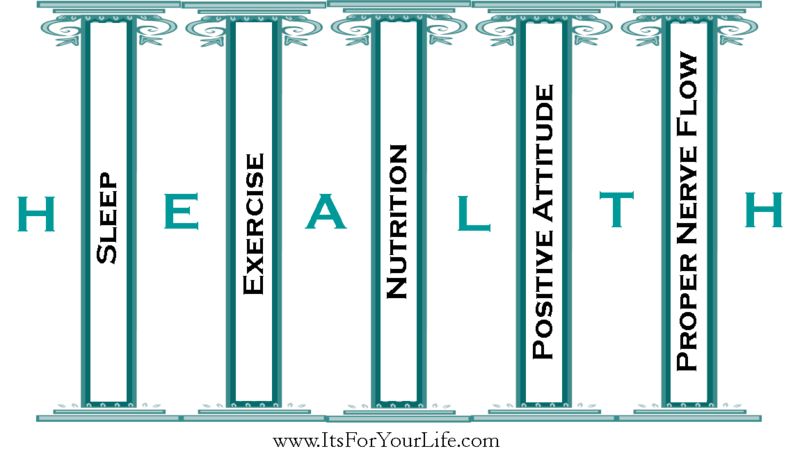 In our practice, Dr. Steve and I emphasize five pillars of health that we all need in order to be healthy: sleep, exercise, proper nutrition, a positive mental attitude, and proper nerve supply. The first four pillars, sleep, exercise, proper nutrition, and positive mental attitude, are the roots of good health. These four seem obvious and self-explanatory as building blocks for health. But what about nerve supply? So many people in our practice have tried LOTS of things that have not worked for them. Blockages in the nerve system, or subluxations, are a leading cause of the body not functioning properly. This is our specialty. We have trained extensively to assess and correct spinal subluxations to remove these blockages and allow proper nerve flow to aid in the body’s ability to function. For more on proper nerve supply and why it is so important to your overall health, check in next week!